The Dwarf White Pine Tree is a lovely pine whose delicate coloring and soft needles hides the toughness and hardy ways of this native American tree. We have chosen a dwarf form that will fit into any garden, or in a pot on a balcony or terrace, as the ideal easy-care gift tree for anyone you want to give a tree to. It is so easy to grow that even beginners will thank you for it, and appreciate its charming habits. To make it even more unique we have placed this tree on a sturdy trunk, to bring it up into full view, making it an ideal plant for foundation planting around the home. Perfect as a gift for anyone, this tree is hardy everywhere except the hottest regions and will thrive in sunny and partially-shaded locations. It can even be grown in a pot on a balcony or terrace, so you don’t even need a garden at all to enjoy a personal piece of the natural world. When it comes to choosing a gift tree, there are lots of things to consider, and the Dwarf White Pine Tree seems to tick all the boxes. 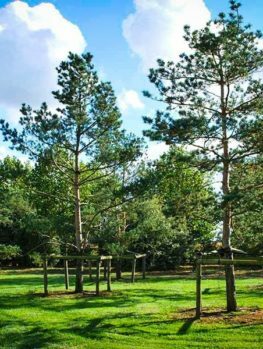 These days some people, especially younger ones, want to grow native species in their garden and the white pine is native to a large part of the country, growing wild all across the north-east. 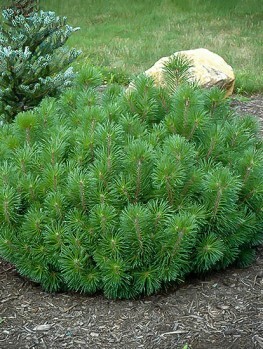 Evergreens are always popular, because they never look bare in winter and bring some green color to the gloomiest days. The Dwarf White Pine is a sturdy evergreen with long, soft green needles that have a delicate soft-blue shade to them as well – a welcome elegant contrast to harsher greens in the garden. Because it is native, deer and rabbits leave it alone, another bonus, especially in rural areas. Because of its small size, this tree also grows well in smaller gardens, or even on a balcony, so it is an ideal gift for the first home of growing children. Whoever you are gifting this tree to, you can be sure they will love its graceful, soft needles and cheerful all-year bluish green coloring. 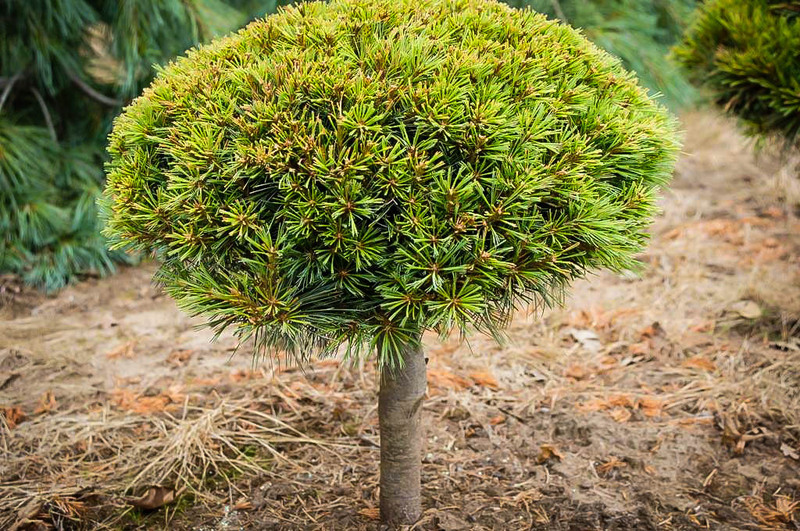 It will form an upright but rounded bush, growing to perhaps six feet tall in time, and three or more feet wide, staying compact and neat for decades. This tree is naturally too large for many gardens, especially modern, smaller ones, so at the Tree Center we decided to re-package this tree to make it into the ideal gift tree. 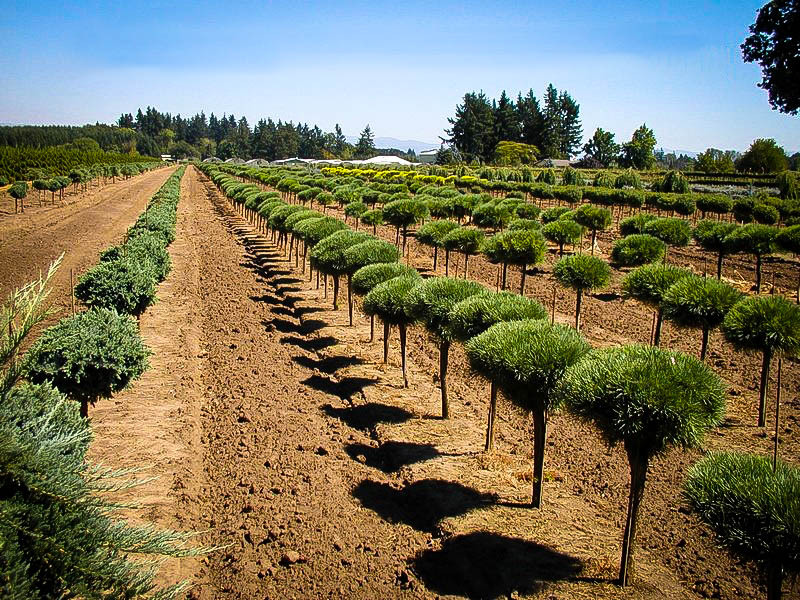 We found some beautiful dwarf forms, that make mounds no more than three feet tall, and had our expert nursery workers mount them onto sturdy stems of regular white pines. This made a lovely specimen that we thought was a perfect tree for a gift to almost anyone. Because these trees are specially grown, they are not at all like cheaper, seedling trees that will grow too large for any modern, smaller garden. 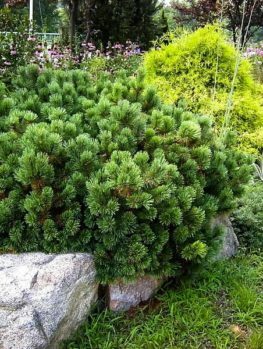 Instead, you can be sure that your Dwarf White Pine Tree will grow into a rounded but upright bush, perhaps eventually reaching six feet tall, with a spread of just three feet, all growing on a strong trunk that lifts it up for everyone to admire. Older trees may develop a few pine-cones, but generally that does not happen very much. Deer and rabbits will not bother this tree, even in the depths of winter, and it is free of any serious pests and diseases. 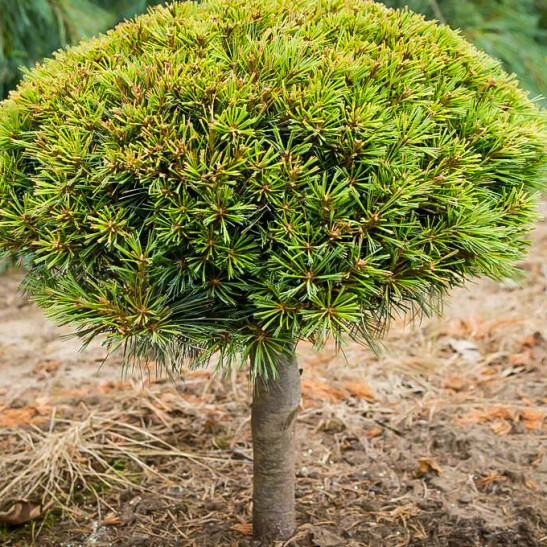 It needs no trimming to stay small and will develop into a graceful and charming tree that will become a real feature in any garden. Choose a sunny location for this tree, although it will also grow well in a spot that has a few hours a day in the shade. It will grow in most kinds of soil, but avoid an area that is constantly wet. More fertile soils suit this tree best, but it really is not fussy. The only thing to consider is the air quality. 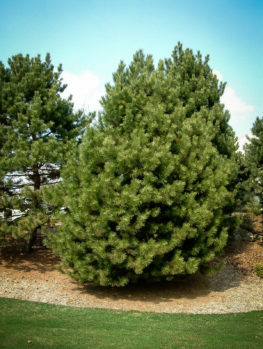 This tree does not do as well in urban areas with traffic exhaust and fumes, so if this tree will be growing in a central city area, we recommend instead the Dwarf Mugo Pine Tree, which is very similar in appearance and size, but with rich green needles. 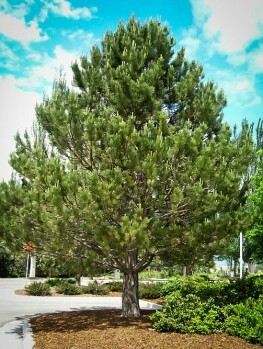 It is very pollution tolerant and also does better in poor, sandy soil than the white pine will. 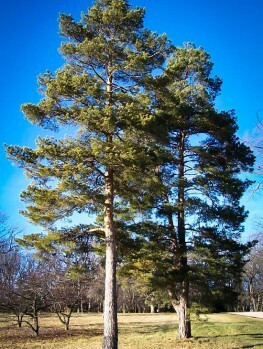 The white pine is a native tree that grows throughout the northeastern states as well as into southern Canada. It is the state tree of both Maine and Michigan, so it makes a very appropriate gift for someone who lives in those great states. In the wild it is a tall tree, with record trees almost 200 feet tall, but in gardens 50 to 80 feet is normal. 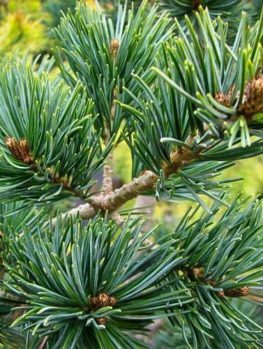 It has soft needles up to five inches long, in a bluish green color, giving this tree a more delicate look and feel than most other evergreens. 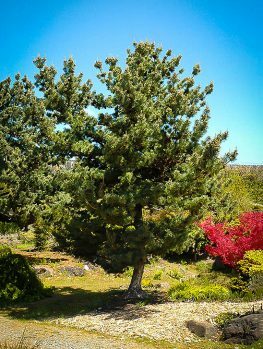 If you are looking for a novel and original gift tree, which is at the same time tough, hardy and easy to grow, then the Dwarf White Pine Tree is the tree you should choose. Since these trees are specially grown to our private specifications, they may be in short supply, even though we are constantly receiving fresh and healthy new stock, so order now and avoid disappointing yourself and the person you want to gift this tree to.